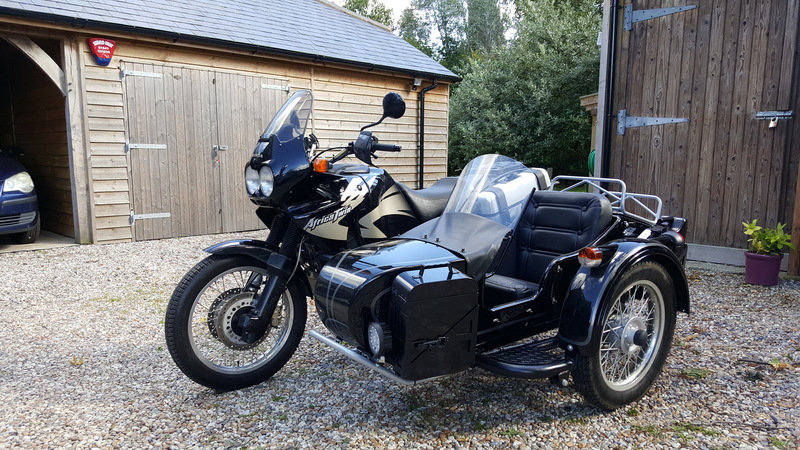 We’re presently (as at October 2017) preparing for our trip and will sail from Tilbury (UK) to Montevideo (Uruguay) on a cargo boat, taking our motorbike & sidecar outfit, in early November. We took the bike, a 750cc Honda Africa Twin, to sidecar specialist Watsonian in the Cotswolds back in June and collected it in August complete with new Ural sidecar. The plan is to travel from Uruguay to the ‘end of the world’ at the southernmost tip of Argentina and then head north, following the Andes, to Columbia, and thence onwards to North America if time permits – we have to be home by the end of April 2018. Update 1 – our planned route has now indeed changed a bit. Our sailing was cancelled just a few days before we were due to leave on 5th November! With no viable alternative sailings in the near future, we are air freighting the bike to Santiago, Chile (see map above). It will arrive on 28th November and we will make our way south through Chile, coming back north through Argentina. So, the route is pretty much as originally planned, only the first leg to the south will be on the west side rather than the east. Update 2 – not so long after starting our journey, we decided not to rush just to meet a pre-planned itinery, but to travel at a more leisurely pace in order to enjoy the landscapes, the towns, and maybe stay for a couple of days or more at those places we like. The loose plan is to travel from Santiago to the south of the continent, then head up to the north of Chile and the Atacama Desert. From there, we have decided to head south again to Buenos Aires, thus completing a large loop of Chile and Argentina. From Buenos Aires, we will head to neighbouring Uruguay and then into the south of Brazil, to spend our final weeks before returning home from B.A. by the end of April 2018. The sketch of our route below can be reconciled with the rather more accurate map below it! We had 60 consecutive rides, only one of which (13) was not on the bike but in the ferry from Puerto Montt to Puerto Natales in the far south of Chile. We stayed in a wide variety of accommodations which included – camping with our own tent; apartments; hotels; hostels; cabanas; hospedajes; and a camper van. We pre-booked some, but the majority were places we stopped at on spec. Those pre-booked were done using Air BNB and booking.com usually the day before or on the day. We never had any real problem with getting accommodation.